This topic was spawned from the AR forum discussion of Dome Mids vs Cones. Let me say first of all that I prefer AR 12 inch speaker systems over others because they have the sound qualities I like already designed into them which in turn makes them easier to set up for my listening preferences. The paranoia from imagining having to rebuild by sound systems if I lost all of my ARs through some disastrous event, assuming I live through it. Create a system that will substantially duplicate the full range stereo sound of a Classic or ADD AR 12 inch speaker. 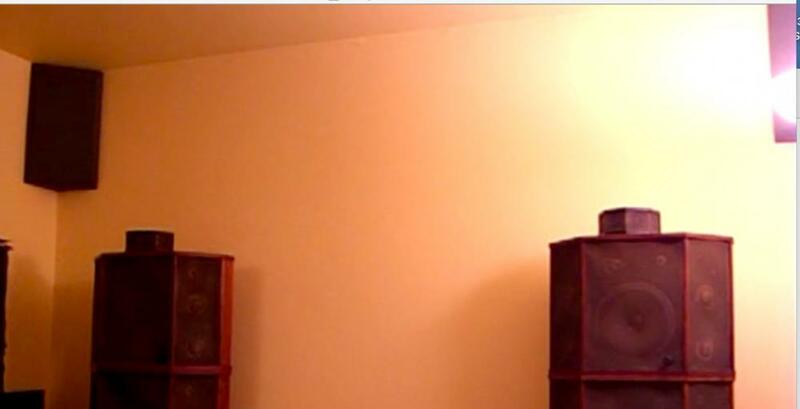 Mirrored pairs of two way bookshelf speakers positioned such that they produce a uniform soundfield covering at least a 90 degree angle per stereo channel. Mirrored triplets would be ok if it really can't be done with pairs. Sufficient, quality watts will be available. Does anyone here have a well informed opinion about which Boston Acoustics two ways would be the best candidates for use in this project which, by the way, is real. Note: I know there are other good 2 way brands available but please limit this to Boston Acoustics because they are so numerous. Also, I have stated the problem as clearly as I know how given that I am not an engineer of any kind. Please feel free to elaborate, qualify or extend but please try to be constructive. b. The difficulty of integrating the Subs with satellites yielding musicality equal to an AR12” 3 way speaker. 2. On a whim. I decided to salvage what was left and see what would happen if I used an AR58s as the bass module for each side. 3. IMO this topic is now about something other than AR or BA speakers alone. If you can imagine two AR3ts angled and sitting atop an AR3 then you can visualize a 12” LST2, which BTW never existed for sale. As I write this, I am listening to a similar configuration , only in this case I am using BA CR65s atop a AR58s pair. My original target with subs and satellites was to duplicate the 58s sound but, as I said, that was failure. What I am hearing now, and for the last five days, is easily equivalent to AR9s except in the very deepest base i.e. 32hz range. I don’t see why this can’t be done with any AR12” flat side woofer system and two amps that can each carry a four ohm load. I already had the amps and 1 equalizer. The additional total cost for used equipment was about $150 which purchased 4 BA CR65s and an equalizer. Edit: IMO perfect candidates are the non bi-ampable models AR58s, AR58b, AR11, AR915, AR91, and maybe AR78 and 98. You could use a biampable model but If you separate the woofers by removing the straps you lose the ability to easily get the volume in balance between the woofers and the mids. The AR mid is your reference for setting the satellite output because the AR mid is already engineered to balance with the woofer output at ZERO attenuation. Don't decouple the woofer if you use a bi-ampable AR. Taking the system to the LST level will require an amp that can carry a 2 ohm load and another pair of BA speakers. I have been listening and comparing this arrangement to 9s and 3as all week using high dynamic, full range classical recordings and demanding non-classical. It does take some dialing in but it really works. Fearing I would come off sounding like just another hi fi nut I almost did not post but this is so doable at a bargain price I decided to share. I have received advice and tips from a few members on this forum that lead me to this but I did not drop your names in case you prefer to remain unconnected with this mess. I have spent another week with this system, spending many hours listening and comparing what I hear to AR9s and AR3s. I have been using recordings that, for me, help tailor my speakers to suit my ears. 1. This system is a keeper. 3. The sound produced is better,in some ways, than my AR9s on big stage recordings such as live concerts but especially Classical recordings that are not mix downs from multi-mike setups. On popular music mixed in a studio I think I prefer the Nines because the soundstage of the hybrid setup seems overly large but the modern tweeters and midranges in the CR65s are better at revealing lower mid- range details, especially in the human voice range, than any of my ARs. I don’t think this is about caps but about modern drivers. Edit: and de-emphazing the 12" woofer role in voice reproduction. I have never heard LSTs but I can imagine they must sound something like this Hybrid system. In addition, this Hybrid system approaches the AR9s in low bass reproduction probably because of the EQ settings and volume on the AR58 Amp. I doubt it is room placement because the speakers are centered along a wall. 4. No speaker attenuators to fiddle with. Absolutely no solder required. No electronic or electrical mods to anything. Complete freedom to aim the speakers any way you choose to achieve the desired effect and absolutely dirt cheap compared to AR9s or LSTs or even unrestored AR3as. 1. WAF. I am not dumping my ARs. This system is in a room of its own where WAF is not an issue. All other systems are in space not conducive to additional amps, equalizers, wires and plugs. If I had the freedom I would try the same setup with my AR9s. 2. If you don’t already have an AR 12 inch speaker there will be additional costs. The attached photos are of the equalizer settings I eventually arrived at to make the sound suit my taste. The key to success seems to be finding the correct setting for the 3 tweeters and 3 mids so they do not overwhelm the woofer output and coordinating the volume settings on each amplifier. If you choose to do this, using similar EQ settings, you will find that the satellite speakers will begin to predominate the character of the sound. You could do this with any small 2 way speakers but they need to at least match the AR linearity. Definitely, most any BA CR series would work and there are many available. Once you find the balance that suits your ear, you can use a master gain control to raise and lower the volume. In the next 2 days I will add a third CR65 per side to assess the effect. I expect to have to rebalance the output of the CR65 package to bring it in line with the bass. We shall see. Attached is the 9 driver configuration of the LST hybrid. The box on top is a white BA CR65. I didn't expect a lot by adding the third CR but in this Holographic configuration it solves the problem of narrow vertical dispersion of the BAs. Previously, listening while sitting was slightly different than when standing. Now there is no perceivable difference. How are you wiring these together? Series, parallel, some combination of both? The BAs are wired in parallel. The 58s were already in place on a separate system. I think I have reached the end of dialing this system in to suit my ears. I had to make a couple of equalizer changes. Some of the astonishing bass turned out to be room resonance at the listening spot, this is small room, which led to a slight equalizer change but much of it was resolved by moving one of the speakers a foot or so. The other issue is about the satellites. The BA CR65 5” driver covers +/- 3b from 65 to 4200hz but IMO it does not cover the 65 to 200 range in a pleasing way. More about this later. I am recording the steps I followed to tune this system as much for me as for this forum because a lot of this was done by trial and error but, on reflection, there is a direct sequential approach that could yield a quicker satisfactory result. Assuming you have all of the equipment necessary and the bass speakers are AR12 inch 3 ways of some model that is not bi-ampable these are the steps assuming everything is already connected and working properly. 1-Get your AR speakers to sounding exactly the way you want them to sound by themselves. Edit: Check the wiring. All speakers should be in phase horizontally and vertically before you continue to the next step. VIP Edit: If you are using a software music player and using its equalizer, be sure to turn off the equalizer before you begin setting the gain balance between the satellites and the ARs. This also applies to hardware equalizers inline before the pre-amp, which should have a bypass switch. BEWARE: You will need test tones for listening to make this set up work unless you otherwise have some very specialized equipment. When you use pure sine wave test tones you can easily damage your speakers. Play sine waves at a very low volume and for not more than 15 seconds per test. Warble tones are safer for setting levels across bass, mid-range and treble . I know they can be found on the 1996 Stereophile Test CD 3 but are probably now available on the internet as a download. 2-Over the frequencies covered by both systems, the basic equalizer settings for the satellites will be at least 2 to 3db above the AR for every satellite speaker in the package. If 2 satellites then at least 4-6 db if 3 then at least 6-9db. Edit: I finally settled on 9db separation starting at 500hz. This is necessary to balance the woofer output with so many mids and tweets. The lower mid-range and bass will be carried by the AR and have equalizer settings that are as though it were a separate system except for the transition point. 3-Move the Satellite equalizer bars all together up to the mark 6-9db above. Conversely you can move the ARs down. Most equalizers only have 12db up and down so you probably want to cut the ARS and boost the satellites to retain some flexibility on both equalizers. 4-Decide what frequency you want to begin the transition from the woofer to mids. In other words, where do you want the satellites to begin fully contributing sound. I eventually chose all frequencies above 250hz because the BAs to my ear sound coarse and woolly and not like an AR from about 150hz on down. 5-Fully cut all frequencies on both equalizers from 250hz down, four bars, and get ready to match the loudness and timbre of all mids and tweeters. 6-Using the gain controls, match the loudness between one satellite and the AR mid. I use a 1khz test tone for loudness matching. When you are satisfied go to the next step. 7-On both equalizers, position the 250hz bar for each speaker system to the same level as the 500hz bar and put on a recording of a male vocalist with a thick voice that you are very familiar with on the ARs. I used Van Morrison, Gordon Lightfoot, Tom Jones and Jamie Johnson. 8-Switch the sound between the Satellites and the ARs and adjust the 250hz equalizer bars until the voice sounds the way you want it. You will bias the timbre of the voice toward either the satellite or the AR woofer, whatever is your preference. Edit: Only timbre match in the 250hz range. Set the voice so it sounds right to you. In the end I biased slightly toward the Satellite's 5 inch driver but originally I biased toward the AR 12 woofer. This setting can be refined with test tones to set uniform loudness across the mid to bass spectrum. 9-Still using the same equalizer settings, cut one channel and on the remaining channel re-match the volume of a single satellite with the AR mid on the same channel. Once you are satisfied turn on the other channel and switch between systems. You should hear very near identical output from both sides. 10-On the AR equalizer move the 32, 64 , and 125 hz bars to the their normal positions, where they were before step 2. 11-You are done with the basic setup but may still need to dial in the bass and maybe adjust the transition point setting. For convenience, you really need a master volume control beyond this point. Edit: Setting the transition and bass levels is really aided by using 1/3 octave bass tones and 1/3 octave Mid Tones at the around the transition point. If you can't find a suitable test sequence on the internet, PM me and I will send you the two files. Edit: If you are using an equalizer before the preamp you should turn it back on now. Edit: The equalizer steps have been revised to make them clearer. My current equalizer settings have changed a good bit from 250hz and below compared to the photographs above . If you are interested I will post or send images of the current settings which do make a qualitative difference. I have been listening for another week and a few adjustments have been necessary. There have been zero changes to equalizer settings and gain balance in the last week but the satellite speaker placement has changed. The attached photos, while not great, are sufficient to show the current and what I believe to be the optimum arrangement for this kind of system. As can be seen in a previous post, I had initially angled two of the satellites at 90 degrees bisecting the AR58 centerline with a 3rd satellite sitting atop, firing upward as a holographic type of filler. The effect was very pleasing once you found the sweet spot which seemed to shift with each recording. It turns out 90 degrees is just too much separation for these BA speakers. You will get lobing, which causes the stereo image to do odd things. All three satellites on each side are now angled at 45 degrees with respect to each other with the top speaker in the package angled outward on both sides. I tried facing it inside for a while but the effect is more spacious facing outward. I also tried 30 degrees which sounds good but seemed to put too much midrange energy into the listening area. EDIT: The white CR65s speakers are facing inward again at 45 degrees and upright. The stereo image on classical recordings was far to wide having a gap in the center. For classical fans the effect was French horns were too close the violins and the trumpets were too close to the basses. Now they are near the center. This arrangement gives a rock solid stereo image. My previous concern that studio mixed recordings seemed overly large no longer applies. Orchestra sections now appear where they should be instead of floating around in space between the speakers. If it is a good recording it will sound excellent on this system. Are there issues? Yes. There are room anomalies that I can get around with position. Overall the sound is stunning. My wife agrees. I introduced her to the system today using one of her favorite recordings and she was impressed. The WAFometer needle is in the green. I am not normally a near field listener but, for this system, room size limits my listening position to between 6 and 10 feet away on center axis, which seems close for so many drivers and watts, but the situation is forcing me to pay very close attention to some details that I might ignore if I were able to get further back to listen. Being so close to the speakers makes dual miked classical recordings sound as if I am near the front row so directional cues become important to establish the depth and breadth of the orchestra which prevents the music from becoming a confusing jumble. The short version of this story is I pulled out an old Stereophile test CD and used a couple of tests that in prior systems held no importance but were a real help is getting this system as tuned as I can get it for now. The CD has a test sequence that tests bass output levels from 200hz to 20hz. This test showed me that my transition setting between the CR65s and the AR58s had too much equalizer boost at the transition point and that my bass boost below transition in general could be increased slightly which eventually allowed me to reduce the overall gain level of the AR58 amplifier. The CD also has a soundstage test which was very helpful in centering the sound image. I had been sensing something was wrong with the left/ right balance but could not determine if it was speaker placement or amp issues. This test showed me that I needed to reduce the gain in the right channels until the centering signal appeared mid-point on my listening axis. Edit: The right channel was returned to previous setting after I discovered that a left channel satellite had a loose wire from all of the speaker placement experiments. This system seems a little much for this size room but an upside is normal gain levels are so low that dynamic range is beyond adequate. It sounds big and spacious but at the same time highly articulate. As to this system vs AR 9s or LSTs my current opinion is: If the latter are within easy reach, either distance or financially, then don’t bother with this hybrid approach. OTOH this system can easily be assembled at a far lower cost and, I know in some ways, sounds better than AR9s. I have no experience with LSTs. If I change my mind I will let you know. I appreciate the effort and with all respects but, I don't buy it! Reminds me of when I was a kid haunting the streets of "Flatbush, Brooklyn" and "Staten Island" in the years 1957 to 1967+ always looking for speakers from TV's and record players, (I've never stopped to this day although now, I only do 'drive-bys' in N.J.), in the trash along the streets of my neighborhoods. In fact 7 years ago, I found a pair of water soaked EPI V100's, and they are usable. I was always hoping and scheming to find something to cobble together to sound even remotely like the stuff I saw in magazines and newspapers. My only concern was to find a speaker that would be the biggest and best than I ever found before. Always looking for the speaker and electronics and whatever else I could find lying around at the curb usually proved fruit-less. Although your creation may distantly resemble a Wilson TOTL monster-speaker, I doubt it'll ever come close to it. Oh, and the AR-LST comparison; I doubt your monster will ever come close to dual LST's driven by dual high-power amplifiers! In parting, again I feel that your efforts are near noble attempt, especially in this day and age but, I still don't buy it. And, I'm not even an expert but, I'm just an individual that's been playing with speakers and amps for over fifty+ years. I appreciate the effort and with all respects, but, I don't buy it! I don't know what a Wilson TOTL Monster is but I will take it as a compliment. With regard to the LSTs, there is no way two of these Hybrids will equal the air moving ability of stacked LSTs but it could match the ability of an LST pair given the same room volume. Each hybrid stack has 9 drivers biamped. The BAs,which carry most of the musical, load are driven by a 500l watt/ch Crown. The 58s, which really only carry the bass, have 100 watts per side and the room is small . I don't know if you have read all of the posts in this thread as well as the ones that originated in the BA section but I understand your skepticism. We are about the same age and have been in this hobby for about the same time but this is not new. What I have done has been done before. It is not ground breaking in execution certainly. This is nothing more than an AR3 with a stack of AR3ts on top. It is in fact something similar to stacked LSTs with 16 blown tweeters and Jantzen electrostatics on top. All I have done is used two equalizers as outboard crossovers to create a transition point between two already proven and well regarded speaker systems. The groundbreaking part, if any, is the equipment to do this is now for sale dirt cheap waiting for someone to seize the opportunity. Before I powered up the third BA speaker my incremental investment was equivalent to $50 in 1975. You couldn't buy an equalizer for that price back then let alone 6 high performance wide range miniature two ways with drivers way more rugged than the comparatively dainty AR Domes in the AR3t or LST. When I wired the 3rd BA, I needed a more capable amp so I spent another 1975 equivalent $50. I now have a total of $100 additional 1975 dollars expended to build out this system with equipment that couldn't be purchased for any amount of money back in 1975. And If I had spent thousands of dollars to accomplish the same thing it would not be newsworthy. The news is, the price to upgrade from AR 58s sound to something much better is negligible. I am not going to spend time on credentials but I do know how live music from large string and wind ensembles is supposed to sound and I know that occasionally a recording played on a full range system, with some listener imagination, can be pretty convincing. When I say this Hybrid Monster sounds better in some ways than an AR9, I know it is true because the two systems are sitting very close to each other in my house fed simultaneously by the same program source. The smooth effortless extended bass of the AR 9 is not challenged by any single driver AR 12 inch but the full range of an orchestra can be convincingly represented on any competent system given a good balance of scale and proportion between the room and a music system with full range capability. Lastly, I am honored that a thread I initiated attracted the attention of your acerbic wit. It is always good to have the opinion of an expert. Hi Aadams, I guess the only true opinion I could have would be if I actually heard your system to make my own determinations first hand. I'm presently struggling with the idea of stacking another set of LSTs on top of my set of four. A year ago I purchased another amp to match what I already have driving my four speakers but, lifting the additional set of speakers over six feet to place them on top of the existing set that sits on two foot stands is causing the delay. Thirty or 40 years ago I would've not hesitated but, these days doubt has set in. Other than that, I question if such a set-up is actually worth the attempt. My set-up sounds very big as it is, do I really want more? Oh, please I'm a hog for big-sound though, I must temper my fantasies with reason. On another note, I'm a dedicated fan of the AR mid-range speaker as much I am of the AR-3a 12" woofer causing me to wonder if the sound quality you're speaking of with your stacking dissimilar brand speakers is of good quality. In any event I think that you're having fun doing what you're doing so, ultimately it's appreciated. Did angling the Boston A40's away from each other eliminate any problems with comb filtering? (Is this the same as lobing?) I ask because once I had what turned out to be a not such a good idea. I made a larger channel speaker with two Boston A40's, but the comb filtering proved to be a disaster. Comb filtering can be altered/corrected by using 'traps'. In my travels I felt my LSTs were affected by many reflections 'pressurizing' the room so, I used two large foam traps that to my ears substantially cleaned-up what I felt needed to be corrected. One trap was placed in each corner and to my ears the result was pleasing and certainly a solution. I might add that a parametric-equalizer would be a beneficial component. Aadams your equalizer appears to be what the same inexpensive one I purchased from R.S. in 1983. For the money it was acceptable to me however, presently it's not being used. When I installed the parametric equalizer I finally realized how much more it did to assist in getting the sound I was looking for whereas the 'graphic-equalizer' didn't add as much flexibility and I come from the 1970's school of thought that any equalizer was taboo and relegated my ears to enjoy the purity of AR's voicing. Ten years ago I purchased a TOTL mint 'Rotel' graphic and it's a beautiful piece but after using the parametrics I don't see any need for it although, in a flight of fantasy, I might in the future combined with the graphic-equalizer. Pardon this awful foto as it was cropped from a video I made while listening but, it shows what I'm speaking about. Did angling the Boston A40's away from each other eliminate any problems with comb filtering? AR Surround I had to read about comb filtering to answer your question. I would say that my term "lobing" was comb filtering. I noticed the problem disappeared when I changed the speaker angle from 90 degrees to 45 degrees. I also raised the crossover/transition frequency from a center on 125hz to a 250hz center, which may have had some effect. RE: 2 Satellites: The effect of using 2 CR65s was Ok but the BAs do not have the power response of the AR drivers and when I would rise from sitting in the listening spot I would notice a drop off in volume. This problem was solved by adding a third CR65. From my experience this approach does not work if you let all speakers run full range with zero equalization. I am speculating here but the LST spectral balance control seems to have been a built in equalizer with 5 different settings where AR engineers carefully balanced the output of the eight dome drivers with the woofer output. This is one reason why for this hybrid setup you need two equalizers and biamping. I will listen more closely for the comb filtering effect and report back. On another note, I'm a dedicated fan of the AR mid-range speaker as much I am of the AR-3a 12" woofer causing me to wonder if the sound quality you're speaking of with your stacking dissimilar brand speakers is of good quality. FM The different brand of speakers is not really a problem. You can use the equalizers to timbre match and get the sound to the point where a instrument on a BA sounds like the same instrument on an AR. In my instructions above on timbre matching I recommend using a human voice because most of us are better at recognizing specific voices than specific instruments but either will do IMO. The BA mids and tweets are still more detailed than my ARs but I can live with either and my other ARs are setup and on autopilot compared to this hybrid system that I am still not sure about with all of its angles and switches and knobs. Yes the two equalizers are 10 band RS units. They cost more to ship than to purchase and they work well enough. The equalizers are being used as gain controls as well as sound-shaping and timbre matching. I am not sure a Parametric equalizer would allow me to do that. 1/3 octave units might be of benefit but would also add complexity. I have to live with this config longer before deciding. Adams, just a quick note regarding what goes on with the AR-LSTs. It uses a six tap transformer which will only equally adjust the woofer and the tweeters together. The mid-range speakers remain constant and aren't affected and not varied at all. I hope this info may be of some help. This afternoon I spent about 2 hours listening while sitting and moving about to assess this system for sound quality. The source material was all Telarc Orchestral with 2 Beach Boys recordings thrown in. The Telarcs are all high quality product using only two or three mics on each recording with no equalization or signal processing after the mike, at least that is what they say. The Beach Boys were used because on their later albums Brian Wilson was very careful about getting the mix right, so the voices in Good Vibrations are pretty much nailed to the center between the speakers. The short version is, after walking back and forth left to right across the listening area I did hear perspective change as though I was moving to the left or the right of the sound source but there was no perceivable drop off in frequency response, also zero beaminess, no “lobing” or comb filtering. In this room, with this speaker arrangement it is difficult to move completely off axis of a mid and tweeter of either channel if the listener can see the front of both AR58s. In summary, the sound is being spread uniformly and wide and so far, no oddball artifacts related to multiple speaker pairs. At the risk of hijacking my own thread I decided to address your post re tone controls in general and spectral balance on LSTs. First , before your antennae and wings begin to buzz, you can stand down because I agree with you, which must mean we are correct? When I first began listening to records I loved tone controls. After I began to spend real money I began to think tone controls really didn’t improve anything. Then, once I discovered the “straight wire with gain” cult, I became a purist that said tone controls were taboo and just another noise source, as long as one had good equipment and a proper listening environment. For me, this led to so much frustration that I quit the hobby for over a decade and just attended concerts. I only picked it up again one day when I was using a computer with headphones and discovered a software equalizer. Short version is I am back and I still don’t use tone controls but I love equalizers. As for the LST, IMO, if it were made two decades later, it would not have a spectral balance control. It would have been designed, built and sold with a guaranteed flat response and the ability to bi amp or tri amp with of course the option to equalize before or after the pre-amp. There is a lot of anecdotal evidence on CSP to support my opinion. Your post also got me thinking about the Fletcher-Munson curves and loudness controls, which eventually led me to this link https://en.wikipedia.org/wiki/Fletcher%E2%80%93Munson_curve and which tells us the curves were full of errors. There are other links within the article that lead to interesting graphs that seem to shed light on why Classic ARs were designed to roll off above 15khz. I think the graphs also show the 1khz region is like ear candy to humans, which may explain why audio neophytes with youthful ears are attracted to speakers with mid-range peaks. In summary, we should have been using equalizers from the time they became practical and affordable. I have been listening to completion, the same orchestral recordings on 3as, 9s and the BLAST Hybrids without AB switching to compare. Of course, there are differences but A/Bing is about hitting a threshold and once the threshold is achieved you must turn to listening to the music. The 3as and 9s are side by side while the Hybrids are nearby in the next room. All three speakers are on separate amplifiers fed by the same source. I listened in multiple cycles to a recording on one set and then the same recording successively on the other two. Except for the occasional very deepest bass of the 9s the differences are not obvious. My opinion about the BLAST Hybrid is that it still sounds as good as my 9s without quite the bass reach and rivals the 3as for the ability to integrate orchestral sound. If we can say a recording is a copy of an artwork, it might, in some ways, also be considered a forgery. Suppose you had three forgeries of a famous artwork in your house, each reproduced by a competent forger and each in a different room. They are all different but even at a close distance appear identical and differences among three can only be detected when they are together. Further, only a minute inspection compared to the original will reveal that the single practical difference is provenance, nothing practical, just intrinsic value. Now, regarding the differences in the three systems I have mentioned: I have attached 2 photos, neither of which are original, but have been altered to try to visually display what I think are the differences in what I hear between the sound of my ARs and this BLAST Hybrid sound. Both images from a distance appear identical but each has desirable qualities not found in the other. If you are using a small screen or you don’t zoom you may not see a difference. Your eyes may not be good enough to detect the difference and you may still prefer one version over another. As with hearing, the choice becomes predominantly subjective. Without the obvious clues to differences with the original, either image, standing alone, is perfectly acceptable as surrogate for the real deal. There is an excellent bi-amping primer beginning on page 31 of the AR 9 reference manual in the library. Hits all of he big issues of bi-amping for those who insist on bi-amping nines, or anything else. I had a long post ready to go about more listening but I decided to sum it up in much shorter post. This hybrid evolved from an existing AR58 setup which can be restored at the push of a button so rather than focusing on Hybrid vs AR9 comparisons, I have spent a good bit of time listening to the original 58s system vs the Hybrid. I was questioning whether my enthusiasm was still grounded. It is. While the 58 has the big AR sound field because of the dome drivers, its weakness, as with all three-way ARs, is the 12 inch woofer having to carry the critical human voice octaves. The big difference between this hybrid stack and the 58 is the octave and a half between 200 and 700hz has been shifted to the 5 inch BA drivers and the difference clearly favors the Hybrid. This also accounts for why I think the Hybrid sounds more like an AR9. By extension I think any AR 4 way up to the 98ls would sound similar to this stack in the sweet spot but only the LST would compete in its ability to flood the listening space with music. BTW I never really listen to human voice on 3as but the same problem seems to be there as well, though the crossover is lower than with the 58s woofer. AR removed middle C (262hz) from the woofer beginning with the AR9 and all of their top systems were this way until the end. I have decided to make one more post because I don't know who is actually taking this seriously and may try to do it. I have posted two additional, very important, edits into my June 30, eleven step post above, that will prove valuable to anyone who might be tempted to make one of these hybrids. The system is still operating. My, months ago, statement that tuning was at an end was premature. I have tamed the overemphasis of deep bass and more importantly have discovered center balance is not obviously simple to achieve when systems are merged in this way with equalizers and power amps. The BA CR65s have 4 gain controls that can affect left right balance while the AR58s have three. What I have learned is identical index points for left and right knobs on the same unit of equipment are not necessarily the same. Just because settings look equal doesn’t mean they are equal. I think folks who bi-amp or tri-amp speakers even with identical power amps may sometimes face the same problem without knowing it. When the LR center balance of the upper speakers differs greatly from the lower speakers it is obvious, but when they are very close to centered yet not aligned it is not easy to detect nor easy to correct by listening without a mono signal. Correcting that last little bit of difference to align the center points makes a huge difference in the sound. My mistake was to assume all the gain controls were working identically and balance the left and right speakers as a group when I should have been centering each system separately before they were all engaged to play music. My acceptance of the close but not correct setting for so long was, I think, because I was still thinking that the problem was with speaker placement or angles or perhaps this was just a bad idea. Happily, the system is improved and for now the beast is tamer and easy to live with. In my 11 steps above I covered vertical balancing of the separate systems but I ignored horizontal, left/right, because it seemed so obvious, but it is not. I have attached an illustration that may help. Over the last three months this system has become my primary listening source. I have always thought it sounded good but equivocated in recommending it as a solution to be duplicated by me or anyone else. It never had operating problems, but it was a kluge that I wanted to simplify without spending a lot of money. The system that was, is gone and has been reconfigured with one box added and five elements eliminated. The new BLAST Stack has 7 operating drivers per side rather than 9. The AR58 woofer is now crossed over at 200hz with the mid and tweeter being silenced electronically. The current configuration, which I foresee as permanent, is a pre-amp, single equalizer, and 2 DSP power amps each having an internal 24db/octave filter to crossover one amp to the woofers and the other to the satellites at 200hz. The 3 satellites sit atop the AR58 cabinet configured as seen the accompanying photo. The arrangement is akin to an Allison 1 or a DCM Timewindow. 1. Configure the amplifier crossover mode and specify the crossover freq. 2. 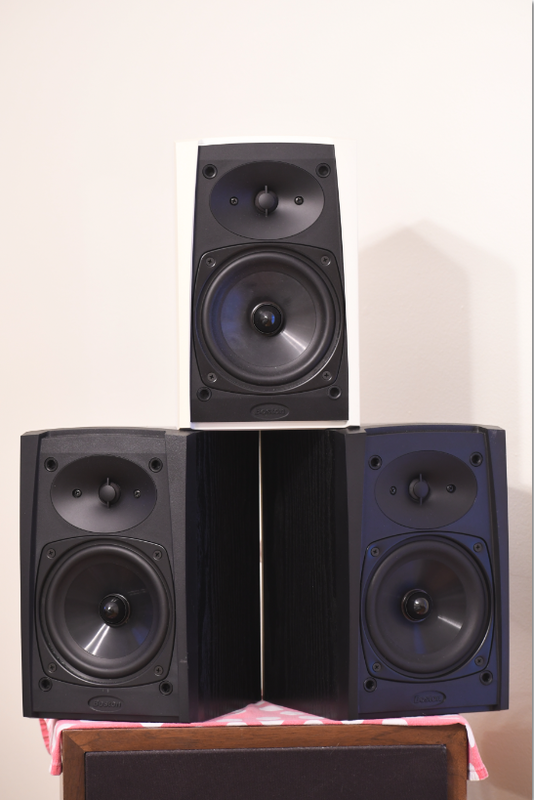 Balance the woofer and satellite loudness around the crossover point using test tones. The sound: The AR woofer in the previous config, even though heavily equalized, was still operating audibly in its full 700hz range. Now, sharply cut at 200hz, with the woofer virtually out of the human voice range, everything is much clearer but also spacious. The astonishing bi-amp power available is a happy consequence that supplies huge overhead reserves. OPINION regarding small satellites for MUSIC SYSTEMS: Whatever you use only need be good quality linear speakers that can be equalized to give the “AR sound” you seek. A 6” or smaller speaker, whether acoustic suspension or ported, is almost never going to produce bass as well as a 12” at 100hz and when used as satellites will be high cut so steeply that mannerly roll off behavior at the extremes will have no bearing on the sound it contributes. And, because this is a non-destructive modification, I would have no reservation in doing this to any AR 3way 12inch, excluding a 3 series, and would consider it an upgrade. Also a great use for thousands of old Advents. Lots of options for speaker arrangement. The pictures show what seems optimal and very pleasant in this room. First one shows the 30 degree offset of the satellites. The second image is the view from the center line. I get a sweet spot up close and spaciousness when I move back. This is far better than the first generation of this hybrid.